Is that allen screw all that holds the pulley in place? I'd have thought there would at least be a flat spot on the shaft to tighten the screw against. Tom, South Bend was notorious for setscrews jammed right in to a finished shaft -- sometimes, anyway. When you say countershaft pulley, I'm not sure if you mean the (larger) input pulley, or the cone pulley that drives the spindle. Your lathe is a lot older than mine, so it might be different, but the large pulley on my countershaft is held with a taper pin, while the cone pulley is retained with a setscrew in a spot-drilled hole in the shaft. You could probably just drill a shallow hole in the countershaft for your setscrew to lock into. the contiuuum from 'belt' to 'gear' drive. were coming off blue, and smoking. It was the cone pulley that came loose. I don't recall paying any attention to that dimple in the shaft when I was assembling the countershaft - just lined it up with the cone pulley in the headstock and tightened it up. Now that I have the set screw in the dimple, it spins right up. Next comes a "proper" glued splice. The Clipper splice works, but the clicking would drive me nuts. I think 1.5" is too short a joint and would try for at least 4" next time, if the current glued joint lets go. I ran a nylon/cloth belt for over five years on my 10L and used a solvent type glue at the time to weld it up. It was some stuff sent by the belt vendor and it was in a little unlabeled bottle and I now suspect that it was a couple of ounces of tire patch glue that the seller recanted so as to hide the fact. I ground each side of the joint with a belt sander. I've just had to cut that belt off because of work on the lathe I'm doing. The glued joint still was nearly undetectable but the gripping surface was shined up and slick as a new plastic toy boat. Next up when this work is done will be a sepentine belt ala Paula's example. I'm liking the idea posted above about using tire patch cement for the job since the belt to be used does look to be rubber more than it does plastic. It's probably some mix of the two and a glue that melts the pieces together rather than just sticking them together seems like the way to go for permanence. McMaster-Carr has a page at the beginning of their glue section that describes the properties and uses of the products they carry. It's an interesting read. a lot better than the one on the 10L. inch - so I wanted to match that. 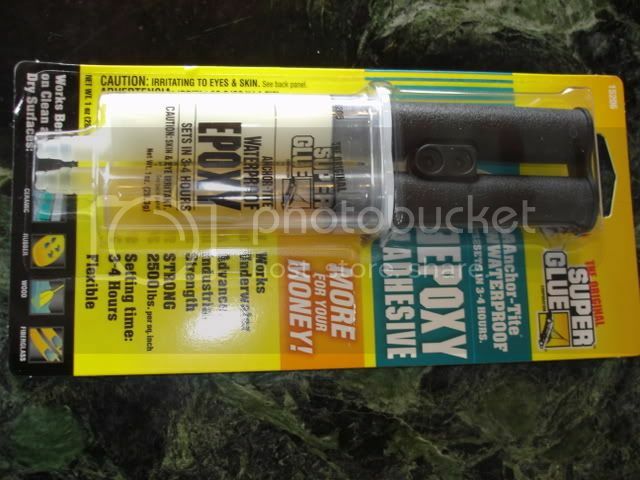 adhesives, like the one pictured above. I was in the hardware store today and went over to their auto part section to see about some tire patch glue. They had the familiar little kit and the tube of glue was marked 'contact cement'. I didn't buy any because I've got a pint can of contact cement at home. I had thought that the glue used in those kits was something special, but now I see that my thoughts were the product of my illusions. Going to the hardware store can have a therapeutic value. other times I'm only taking inventory. had particular aromas and stock peculiarities. old kid. That stuff was better than television. oiler I had apart, using that serpentine belt. apart, and had clamped the heck out of it. so, but now it seems to be holding splendidly. Jim I think your correct on having standbys, I have the leather belt and the other glues nearby and couldn't have a problem if I begged for one, but if I got rid of backups I would be there on sunday night trying to finish something up with the what the H#LL DO I DO NOW! look in full force. do me a favor and let me know if you try the epoxy in my picture. I called them and they reported the holding strength is grossly understated and pretty impervious to liquids. On a previous post on this thread I reported I had taken a serpentine belt from my Chevy and put on a new one. I am happy to report the used one works very well on my SB9 and no glue required. I simply cut it to length, drilled small holes in the bottom of the 5 groves and with a threaded needle with small dia stainless steel thread laced the ends together. I wanted to try this on a no cost belt to see if it worked and it exceded my expections even tho its old, some cracks and may be somewhat hardened. Its hard to believe a fresh 10 rib vs my 6 rib would do much better, but will probably try it with glue for the $25-30 cost. Update on serpentine belt adhesives. apart after a couple of quick flexes. with a felt-tipped 'activator' pen. Whoever recommended that stuff, it worked great. coming apart at the edges. of pieces, in an approximation of a real joint. to pop loose at the leading or trailing edges. Jim, the last glue you listed sounds like it is real similar to what is still holding my belt together. I have done so much machining on that glue and it's been holding up fantasic. keep us tuned in with your progress and pictures. you know the funny part of this is the belt was allways the first thing I had to contend with every time I used my heavy 10, now I just keep on useing it, more and more. nothing but machining and checking the gitz oilers. Jim Rozen, how about telling us the comercial name and where to buy the super glue you mentioned that worked so well on your serpentine belt and also the joint length. A first test is in order. jim, if you get the chance, please post the brand name for the glue you have bought. I have a couple of machines that would like re-belting, and would like to get it right the first time. p.s. Thanks for all the great information. I am always very glad to learn something new. especially something so helpful and useful. I just tapered and glued a serpentine belt for a 13L a couple weeks ago. I have only run the machine a couple hours total so far but the joint is still fully "stuck" no indications that it will peel or let go so far. I used regular old "superglue" whatever Devcon brand calls it no specific reason I used that brand....only because that is what the parts store happened to have. They had thicker stuff but I prefer the regular "thin" stuff since it spreads easily and sets quickly. It only took one of the tiny tubes with some left over. I think most any cyanoacrylate sp? glue will work such as "super glue" or "krazy glue" etc. Hobby supply stores always have cyanoacrylate glues in different thicknesses an quantities too. It's widely used by model builders. Also...the joint length, I tapered the ribbed side about 4-5". The "smooth" side doesn't taper very well, I just put it on the belt sander until I had about 1-1/2" lenght of the cords just exposed. I tried to make sure I did as little damage to the cords as possible, just enough for the glue to get into. scale, the belt is one inch wide. This stuff seems to be perfect for the situation.